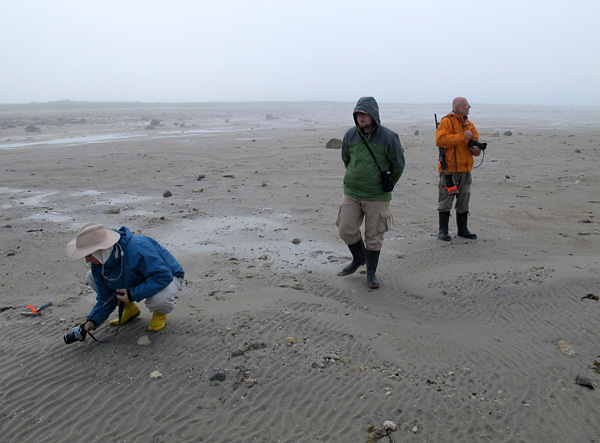 Since I study the creatures that lived along ancient shorelines, I often contemplate tidal flats. This is, however, a scientific, mostly objective contemplation. This evening I saw another side of these wonderful places between sea and land. 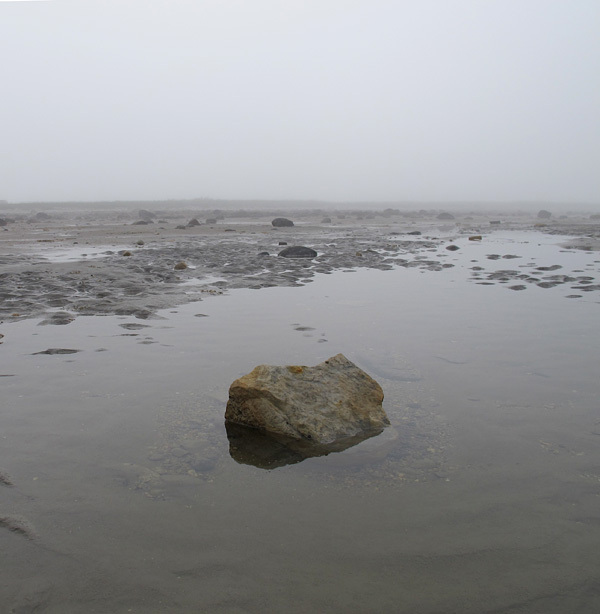 We took a walk in Bird Cove near Churchill, Manitoba, and in the quiet bright fog it was a place of utter peace and openminded contentment. As my friend Debbie pointed out, it was like a Zen garden, and we felt a serene calm as we walked slowly and silently back toward the shore. The only hindrance to reaching a higher plane was that we had to remain constantly vigilant in case a polar bear just happened to wander up through the thickening mist. 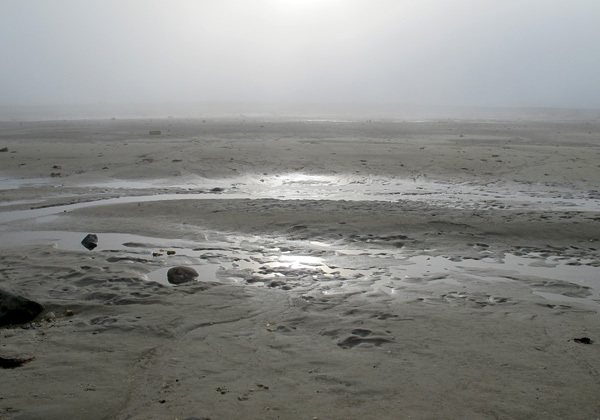 Broad shallow channels shine silver in the fog. 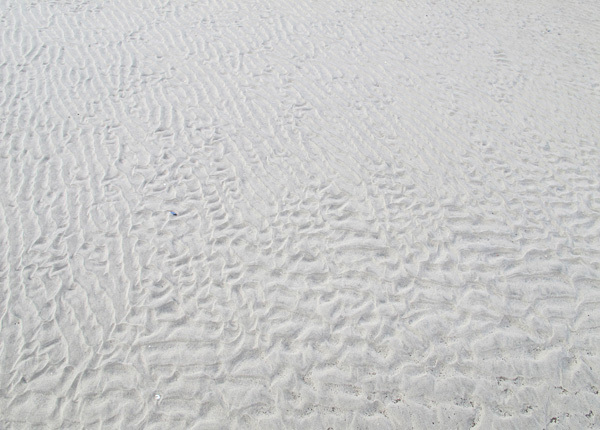 Ripples form a Bertillon Pattern. 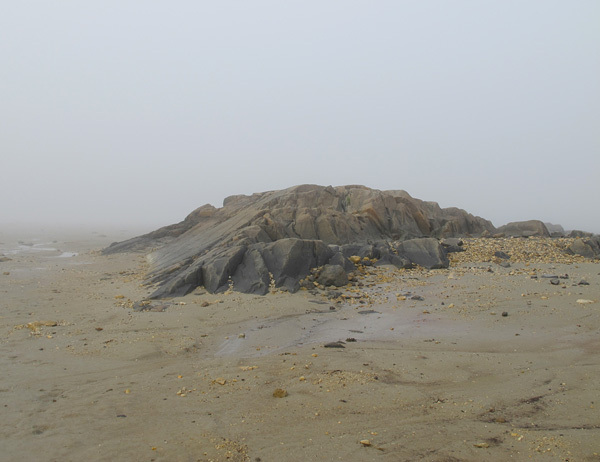 A knob of Proterozoic Churchill quartzite looms out of the fog. 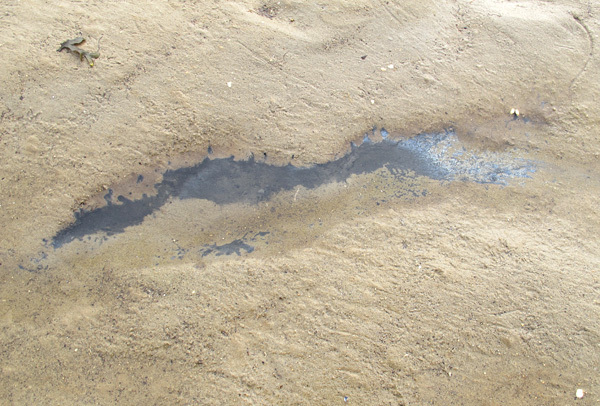 This narrow pond penetrates into the dark reduction zone hiding below the pale sediment surface. From some angles the ripples seem to go on forever. Interference ripples take on the appearance of a ruched fabric. 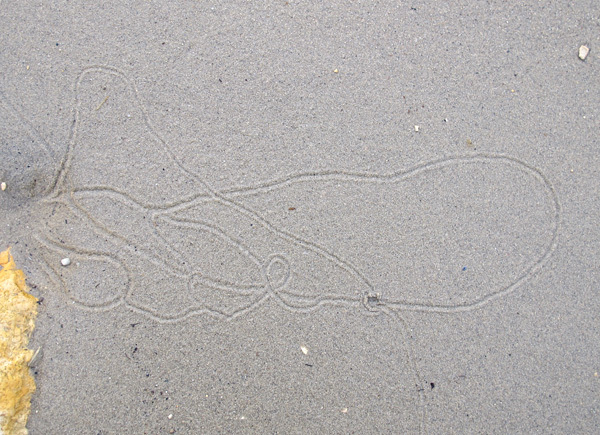 If only the snails that made these tracks could spell, they would produce a beautiful cursive script. 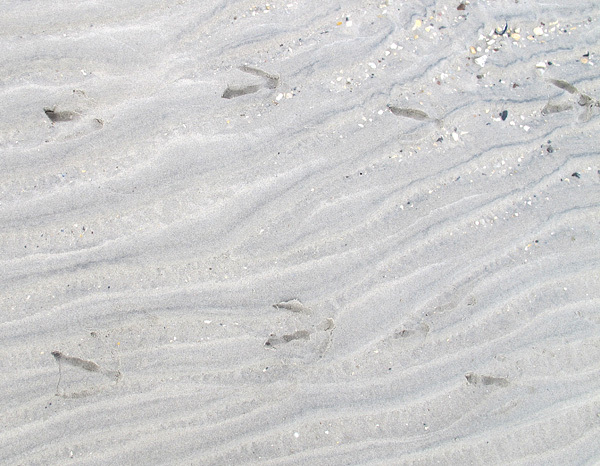 Ten out of ten paleontologists think of Velociraptors every time they see large bird tracks. These particular theropod prints were made by a Canada Goose. Excuse my ignorance, but what causes the ripples? This is one of those “why don’t I know this?” questions that irritates me, and I never remember to find out. Otherwise, another lovely post and beautiful photographs. 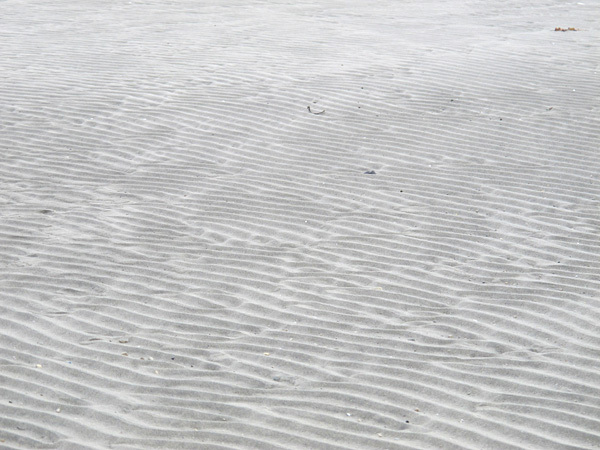 As water flows in one direction it picks up sand and lighter particles, but loses some energy due to friction; as it flows back (in water waves or tidal movement), it has less energy and so deposits the sand. 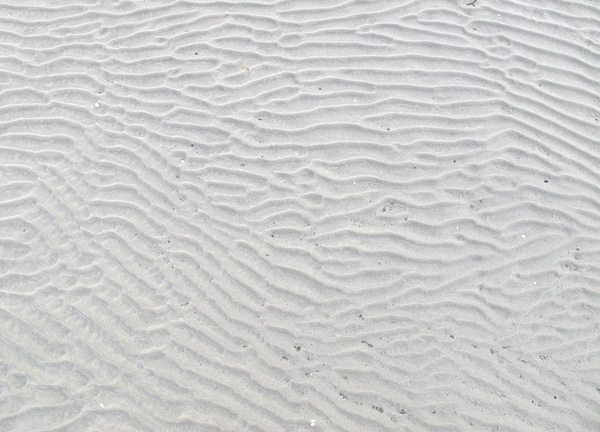 The movement of the water and particles inside the wave is circular in cross-section, so sand is deposited unevenly laterally, forming the ripples of sand, mirroring the ripples (waves) in the water above. Ahh, Your photographs capture the beauty and subtleties of nature. Along with science! These are extremely beautiful images Graham.